Common snakes in Singapore – A major part of Singapore is occupied by skyscrapers and buildings, turning the landscape to a concrete jungle. The consequences of this urbanisation means animals are affected as they are forced to retreat to more natural habitats, which are still in close proximity to houses and buildings. From time to time, snakes may pay visits to residential areas and public places. Although they are creatures to be feared and are disliked by many, it is still important to be educated about them if ever faced with a snake on your path. A snake is a reptile without limbs that has features such as a short tail, jaws capable of extending itself considerably, unmoving eyelids and some with venom and fangs. There are exceptions to these as certain snakes have limbs and some snakes are non-venomous. The differences between venomous and non-venomous snakes may not be very obvious but it is important that people are aware of the dangers of these snakes. 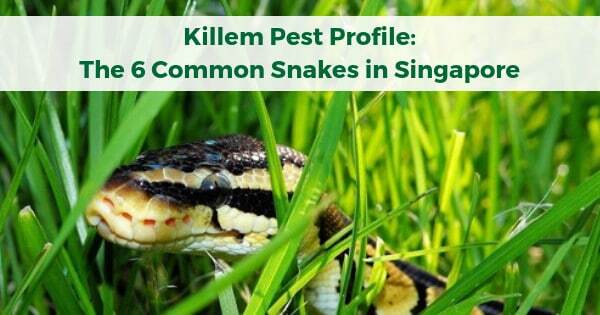 There have been many species encountered in Singapore but there are 6 common snakes to be highlighted. Some of these snakes can be dangerous and professional help should be sought if they need to be removed. 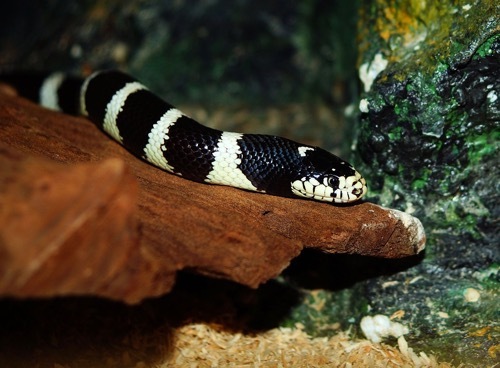 One of the more prominently patterned snakes, the Banded Krait is stripped in black and white from head to tail. It has a mostly black head and a body with a triangular cross section. This is one that can be spotted from a far and should not be approached as it is venomous and may bite if threatened. They are normally active at night, where they hunt for their prey. They feed on other snakes especially, even the venomous ones, as well as rodents, cats, lizards and fishes to name a few. Based on their eating habits, they can be found in forested areas near rodent holes, termite mounds and places close to water. The Banded Malayan Coral Snake, also known as the Calliophis Intestinalis, is a venomous snake. It can grow up to 50cm in length and can be distinguished from the reddish stripe along the length on the top side of the body and the bright red tail. 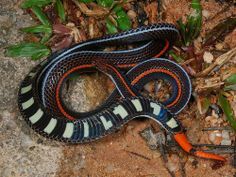 On the underside, however, it has contrasting stripes of black and white that it flips to and portrays when threatened. In Singapore, the chances of crossing this snake can be high if visits to parks and forested areas are frequent. They mainly eat other snakes and are known to eat even their young ones. They are active at night and therefore can be difficult to spot. They may look small and attractive but their venom can be potent. It is best to stay away from them if sighted. The Naja Sumatrana, or also known as the Black Spitting Cobra, spits venom if it feels threatened at a closer distance, as the name suggests. It does so to aim its venom at the victim’s eyes. The eyes and areas surrounding it should be washed immediately to stop the spread of permanent damage the venom does to the tissues. If bitten, the venom can cause death. They are normally black if not black with a slight blue tinge. They are known to be aggressive if provoked, erecting their hood, standing tall, hissing at their tormentor and finally spitting venom as a final resort. These should be considered as waning signs if this snake is encountered. 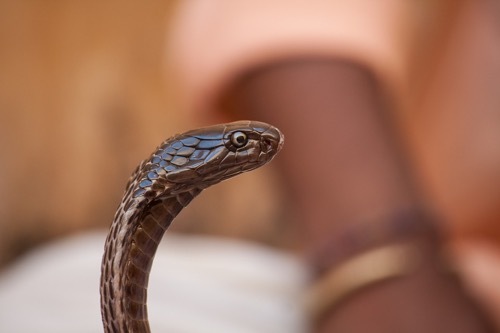 The King Cobra is known to be the largest venomous snake in the world. It is notoriously known throughout the world to be a dangerous snake that everyone fears. They can be extremely aggressive in other parts of the world though they are not as much in Singapore. If encountered, however, it is best to stay clear of its path and move away quickly as a bite and venom from this snake can be fatal. This snake is generally big and its hood is distinctively bigger when spread fully. They can stand tall as high as six feet from the ground and project a hissing sound almost resembling a growl, to intimidate their tormentor. They are of varying colours but are mainly in shades of light brown to dark brown and even black with a pale yellow underside. It has a set of large head shields that are not seen in most other snakes. All these features may give the snake a graceful look but it is in the least bit gentle if encountered. It feeds on other snakes predominantly, not leaving the venomous ones either, as well as rodents and lizards. In Singapore, this snake was encountered fighting a Reticulated Python once and had to be removed by Killem’s Pest Control Operators. Professionals should be engaged in such cases as they have the proper equipment and are educated on how to safely remove such snakes. Snakes may look vicious but not all of them are venomous. There are also some snakes that are venomous but the amount of toxin may not be sufficient to cause fatality in human. 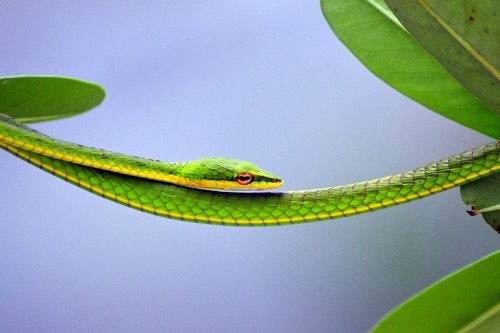 This is a fairly small and lanky snake that is able to blend in with the vegetation due to its bright green coloured scales. They can grow up to a maximum of about two meters in length and can also vary in colours from light brown to bright green. They are usually seen amongst low hanging trees or tangled between vines in forested areas. They may not seem like they can do much harm but they do in fact carry venom, though not enough to kill a human. 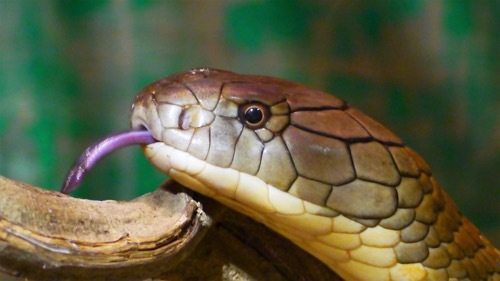 Small birds, frogs and lizards usually fall prey to this snake. If encountered, do let this snake slide away as it prefers to avoid confrontation but if agitated, it may bite. One of the most widely known snakes, the Reticulated Python is the world’s longest snake at almost ten over meters being the longest. It has an unmistakable alternating, consistent, zigzag pattern of black, yellow, brown and white scales that is recognisable all over the world. 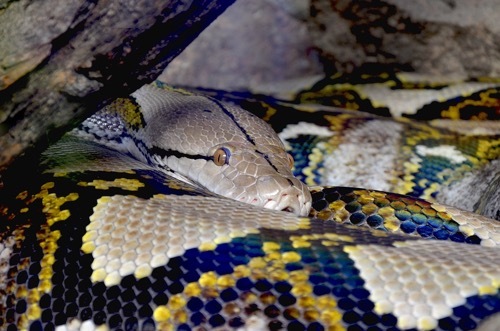 This python has a head that is protracted outwards, longer than other snake species and has eyes that are dull orange with black slit-like pupils. The way this snake hunts its prey is different as it constricts its prey, suffocating it before having it as a meal. This was the other species of snake that was in a battle with the King Cobra, mentioned earlier, constricting it as much as possible given the big disadvantage in size. It may not be venomous but it is still able to bite and suffocate its victim. It has a diet of small mammals such as pigs, dears, rodents and birds. The pythons found in Singapore are comfortable inhabiting the urbanised areas such as the drains and canals. They are able to adapt to changing environments but can still be found in forested areas. They are active at night but can be seen hunting even in the day time. The shear length and strength it renders to constrict its victim are indications that professionals should be called immediately once sighted. Snakes can be dangerous but are sometimes a blessing in disguise, as mentioned in one of our previous posts… What Common Pests Are Found in Your Garden? where snakes were known to reduce rodent population in residential areas and gardens. It is important to know the difference between the venomous and non-venomous snakes so that extra caution can be taken. Like most other creatures, they prefer to be unprovoked and are not confrontational. The best way to stay clear of any unexpected attacks if encountered with a snake in your path would be to leave ample space between yourself and the snake as well as a clear exit route for the snake to slip away. If you do come across any snakes in your residential area or in urban places, do call a professional immediately as they may pose a threat to others. The Pest Control Operators (PCOs) at Killem are able to rescue, remove and capture snakes that are then released back into the wild, away from the urban landscape. Proper equipment such as snake thongs, gloves of thick material, heavy duty boots, goggles, long sleeved shirt and pants should be used when handling a snake. Engaging a professional is always the safest option when it comes to handling snakes.